Sticking with our current trend of trying to cook a bit healthier, I bring you our version of blackened trout. I say “our version” because we didn’t quite cook it the way it is supposed to be cooked. For those unfamiliar with blackening, it is a cooking technique used in the preparation of fish and other foods. Often associated with Cajun cuisine, this technique was popularized by Chef Paul Prudhomme. For this technique, the seafood (or chicken) is dipped in melted butter, then liberally coated with a mixture of herbs and spices and then cooked in a very hot cast iron skillet. The seafood should have a brown-black crust that results from a combination of the browned milk solids of the butter and the charred spices. And don’t get me started on the tartar sauce! That stuff should be illegal! I could eat it straight. In fact, I might have had a spoonful or two of it after I whipped it up. You won’t tell, will you? 😉 Do me a favor…toss out that jarred crap you have floating around somewhere in the back of your fridge and make your own. You can thank me later. Ok, let’s get started with the tartar sauce, since the longer you let it sit, the better it gets. The trout went “meat” side down at 500F to start. After removing the trout, throw a few shrimp on for a few minutes. Mix together ingredients in a small bowl. If not using immediately, store in an airtight container. Ok, you’ve got your tartar sauce prepared and your blackening seasoning is mixed up and ready to go. 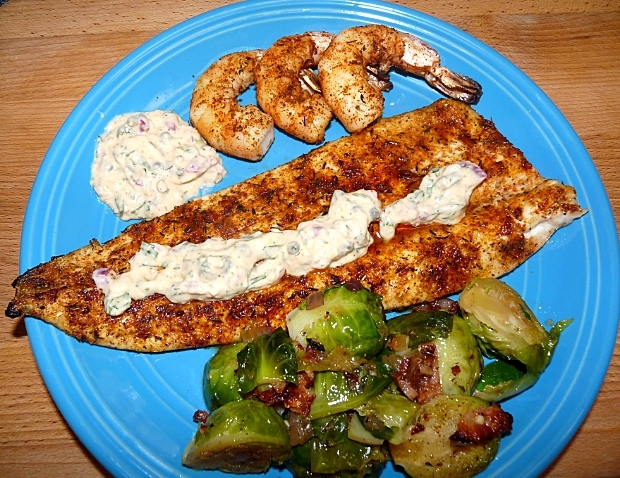 Time to get started on the fish (and shrimp if you want to add some as well). Pre-heat your grill to medium high. For our Big Green Egg, we stabilized it at 500F. I like to use a grill basket when doing fish as I find it easier to flip the fish. (If you don’t have one, it is not the end of the world. You can cook it on the original grates). Insert the grill basket onto your grill and let it come up to temperature with the grill. 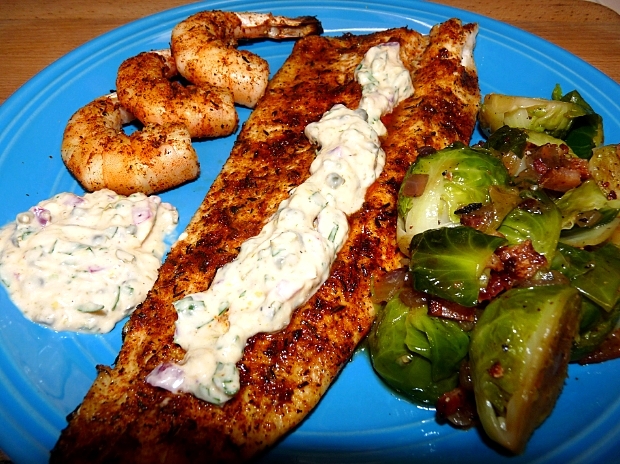 Brush your trout lightly with olive oil and season liberally with blackening seasoning. I mean go heavy with the stuff. Don’t hold back. 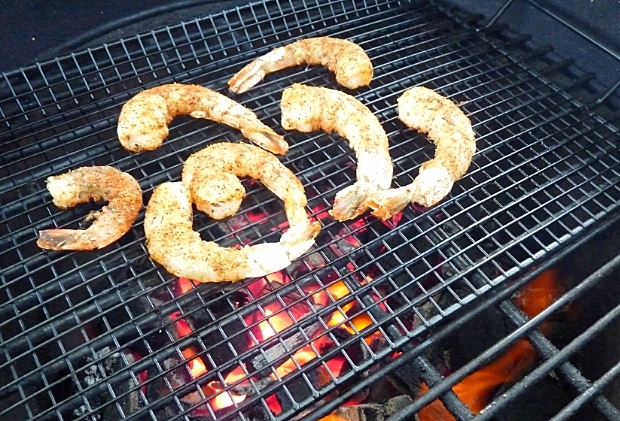 If you are going to do some shrimp as well, shell the shrimp and dust with the seasoning. When you are ready to grill your fish, pour some oil on a paper towel and wipe down the grates on your grill. 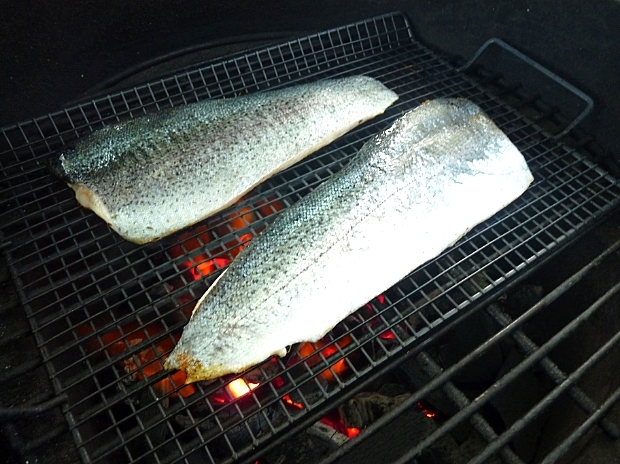 Trout is a fast cooking fish, so do not leave your grill while it is cooking. Place the trout meat side down on the oiled grates and grill for 2 to 3 minutes and then flip. If the fish is sticking to the grates, allow to cook 30 seconds to a minute more and then try to flip. The fish will cling to the grates until it is ready to flip. Once you flip the fish, grill for another minute or two. Remove from grill when fish reaches 135F. Allow fish to rest covered loosely with foil for 5 minutes. The temperature of the trout should carry over to 140-145 while resting. While the fish is resting, through a few shrimp on the grill if you like. They only take a few minutes per side. Serve with plenty of your home-made horseradish and tarragon tartar sauce on the side. We’ve made the tartar sauce numerous times since this post was written. In fact, we no longer buy pre-made tartar sauce anymore. While the red onions work fine, we’ve found that if allowed to sit, they tend to “stain” the tartar sauce and make it pink. We have subbed in yellow onions and that has fixed the problem without significantly changing the flavor profiles. While the red onions might give it an aesthetically pleasing edge, unless it is to be served within a few hours, we now opt for yellow. That looks amazing!! May I ask what brand of grill basket you used to cook the fish? Also, do you think a white fish like tilapia would stand up to this type of preparation, or does it need to be a “stronger” fish like trout? I’m not sure where I picked up that grill basket, I’ve had it for years. You can usually find them at Home Depot or Bed, Bath and Beyond at this time of year. I also have one that is more like a stamped piece of metal with round holes in it itsead of wire grates. Works great for fish, just make sure to oil it right before the fish goes on so it doesn’t stick. I think tilapia would work if you have a grill basket. Its a very delicate fish, so I wouldn’t do it directly on the grill’s original grates. We don’t really do tilapia after I did some research on how they are raised. If you do eat them, try and make sure they are raised in the US and not in China or South America. That is a good tip about the stamped metal basket. I think I will look for that — and I didn’t even think about the origins of the tilapia. 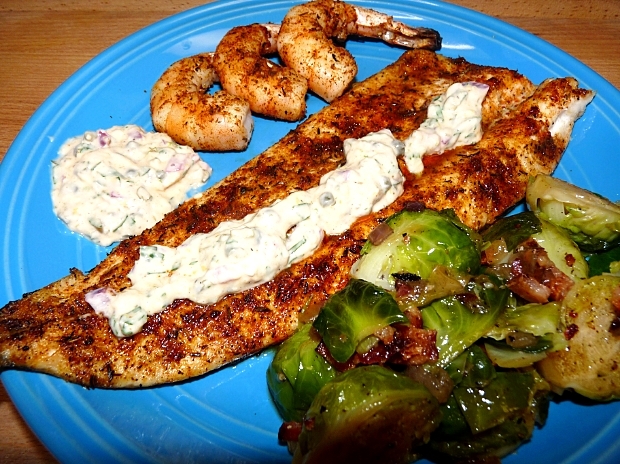 Maybe I will try it with Alaskan salmon instead 🙂 I’m just not the biggest trout person, but the seasonings and the sauce look so amazing in your photos! Haha, I’m pretty sure that Mrs G makes Brussels sprouts exactly the same way I do. It’s how I managed to get my husband and his friends to enjoy the most-hated-vegetable for the first time in their masculine lives! 🙂 Love the look of that amazing trout. The tartar sauce sounds delicious! 10 points again Griff!! You must try the tartar sauce. You won’t buy store bought again. Okay, that tartar sauce is making me drool. Love that you and I are both cooking a lot of fish right now — great inspiration! Trying to be healthy. The plus is we get to eat a lot of seafood and we both grew up on the coast and love seafood. I meant to say earlier that I really like your new blog layout. Simple, easy to read and eye catching. Great looking fish. I like blackening on the grill, it gives such a deep savory flavor. Thanks, Chris. I’m really digging it as well.